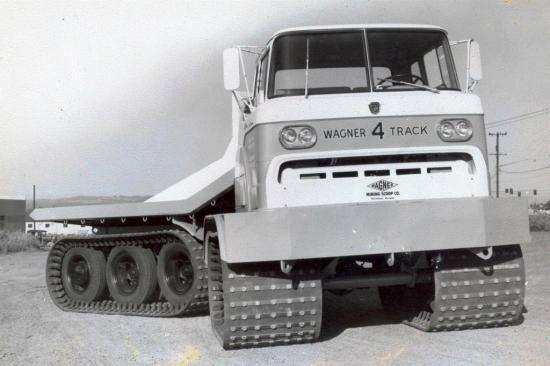 3 - Articulated Tractors WI-30, 700 hp by FWD Wagner, a precursor. 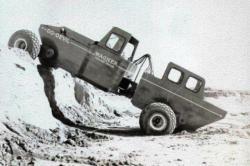 Pict J M M Collection. 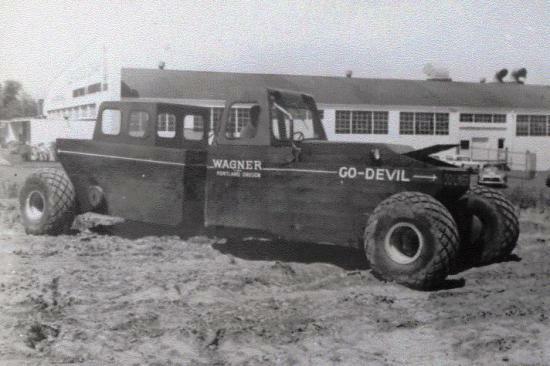 6 - Elmer Wagner to controls of Go-Devil. 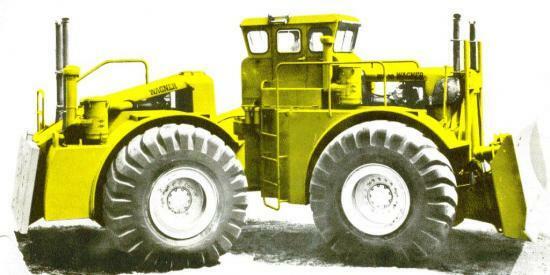 Pict of review 'Mécanique Populaire', French Edition, Aug 1961. 7 and 8 - Devers does not scare the Go-Devil designed for this job. 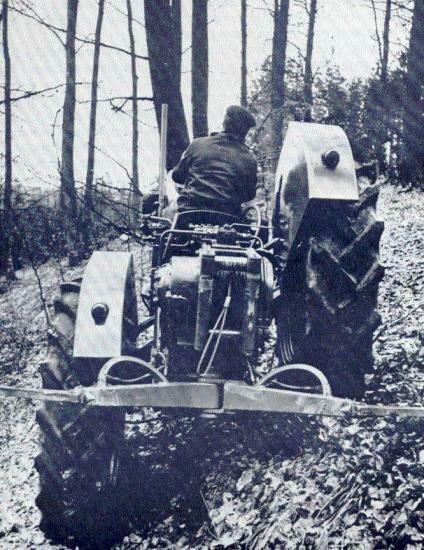 23 - Pekazett tractor equipped with hydraulic pendulum system. 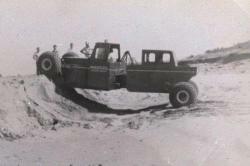 Pict of Journal of Terramechanics, 1970, Vol 7, N°1, Pergamon Press, later Elsevier. 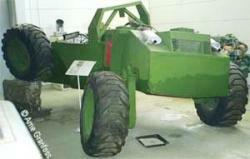 24 - X-Musen from the beginning of the 60 was developed by the Swedish Defense Research Institution and is now at Strängnäs in the new museum in 2012. It looks like Go-Devil. 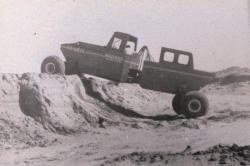 25 - Home built rig by James M. Bird of Tulsa Oklahoma. 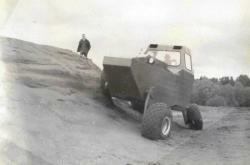 Hydraulics motors drive the wheels. 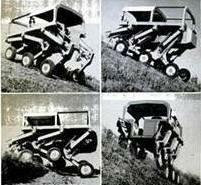 The independent suspension arms are moved by actuators up and down 2 m. Pict from Popular Science, Jan 1971. 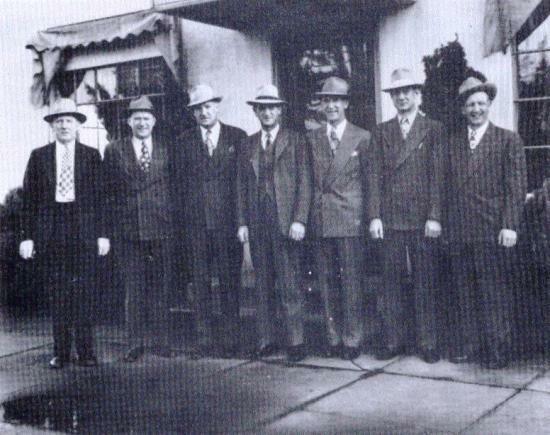 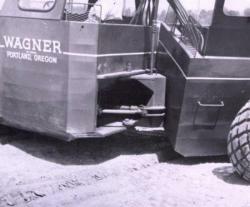 The seven Wagner Brothers emigrated to Portland, Oregon in 1922 and created their first company in 1936 : the Mixermobile. 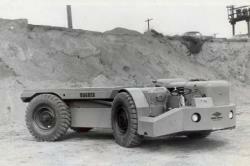 The innovative product on the market was a truck with concrete mixer to deliver concrete to the desired location. They also created the 'Scoopmobile', three-wheeled loader and especially in 1949 the first 4x4 articulated loader, idea of Elmer Wagner then taken by all concurence. Wagner Tractor was born in 1953 and Wagner Scoop Mining Company, all companies specialized in large 4x4 articulated tractors, loaders, for industrial, agricultural, forestry or mining use. Companies of Wagner Brothers changed hands several times since 1962. 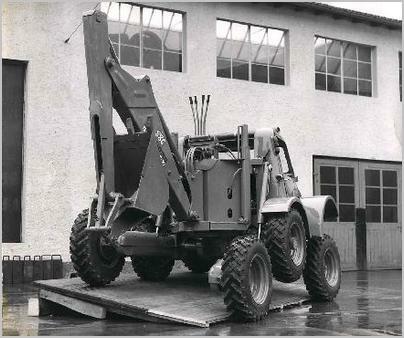 Today, Atlas Copco has resumed mining equipment, whose manufacture was transferred to Sweden in 2005 and Allied Products has taken the forestry equipment. 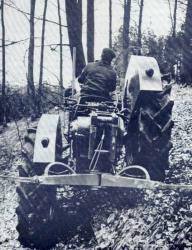 The tractors were manufactured for 14 years. 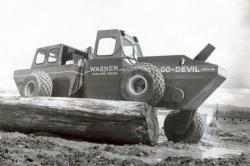 Elmer Wagner, the great group inventor (20 patents to his credit), produced a prototype in 1961, the Go-Devil (U.S. Patent No. 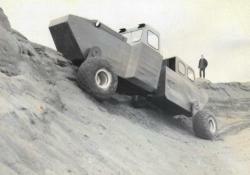 3,057,319), all terrain and amphibious vehicle particularly innovative for its time. It must be said that the 60's and 70's were very prolific in this area, due to corporate wealth and studies to go to the moon. 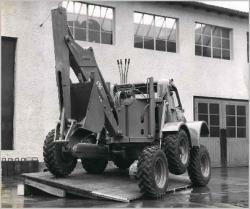 Then rested to Erwin Wagner construction of the prototype, which lasted two months, and product promotion. 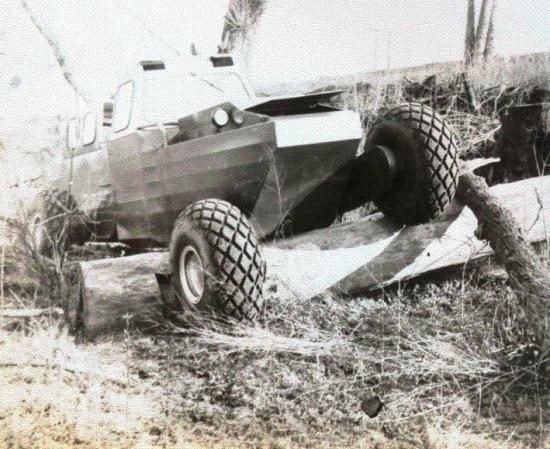 It was a 4x4 amphibious vehicle, articulated in yaw and roll which could be used to personnel transport, foresters, emergency, fire, geologists or the army. 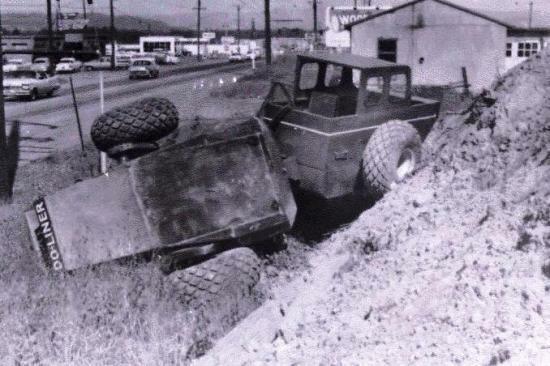 Wheels mounted at the end of an arm and driven by chains could orbit of 360 ° giving extreme opportunities and even today it still surprises us. 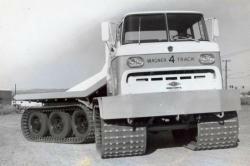 Four hydraulic motors controlled by four controllers made the position of the wheel fully independent. It could traverse any terrain, also capable of cross holes, tree trunks, or landslides. 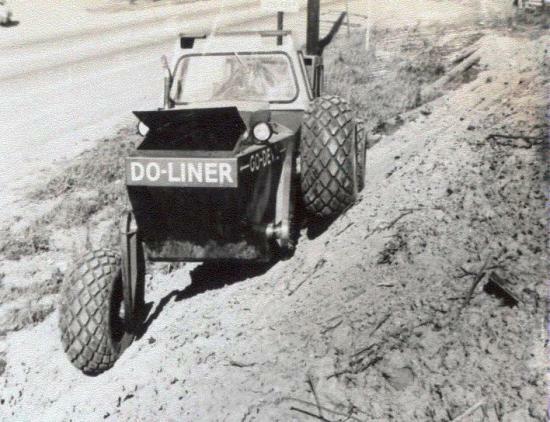 Before an escarpment of 2 meters high, the operator raised the nose of the Go-Devil against the rim, made orbiter front wheel up, and rolled until the rear wheels reach the wall and made them to orbit turn. He could run horizontally on a high side slope (35 °) without overturning. 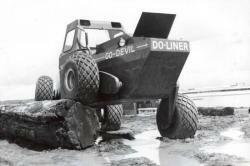 In almost liquid mud, he rested on the bottom and made orbit the wheels to go forward. A propeller propelled it in water and out of steep banks, already difficult for a tracked vehicle, did not pose problems. 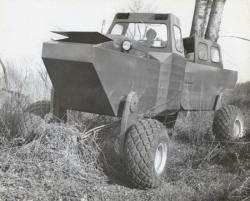 Its characteristics were: clearance max 152 cm, length 7 m, width 2.28 m, weight 3.4 t, turning circle 10,80 m, gasoline engine. Unfortunately, this unique prototype no longer exists. 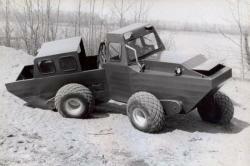 - a home built rig by James M. Bird of Tulsa Oklahoma seen in Popular Science of January 1971. Today, several robots for rescue or planetary exploration are self-leveling. 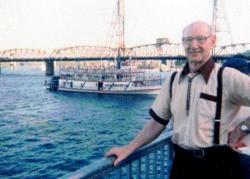 Pictures of this paper related to Wagner come from J M M Collection (from Erwin Wagner).